The rule authority which Blackjack Single Deck is based upon is the standard Atlantic City game rules. Dealer hits on soft 17 and stands on hard 17. You may split any pair once, but there is no option to re-split. Ace pairs which are split take only one more card each before the player must stand, and if that card is a 10-point card, the hand counts as 21. Doubling down costs an amount equal to the original bet, and is available on all hands, even after you split. You can purchase insurance if you are so obliged, but it will cost half your original bet. You can never, ever surrender. You may any amount between 1 and 500 USD/Euro/GBP in Blackjack Single Deck. Bets are made using chips, which come in five different sizes – 1, 5, 25, 100, and 500 – which is handy if you want to bet 162 or 34 on a hand. After all the betting is finished and you’ve played your hand, you might find that you won. If that happens, you are paid as follows: blackjack, 3:2; insurance, 2:1, standard win, 1:1. In the event of a tie, meaning you have the same value hand as the dealer, you get your money back and everything starts all over again. With its advanced 3D graphics, smooth animations, and digital sound effects and music, playing Blackjack Single Deck is an exciting experience that can rival any visit to a casino. The game is not without its bumps – the cards, for example, can be hard to read sometimes – but if you are after a single deck game that looks great, then you can easily get over those minor issues and get on with the fun-having and money-winning that only blackjack can deliver! The most crucial part of vlackjack is knowing when to stand, and when to hit. The most general rules for this are as follows: 17 or lower – hit; 18 – hit if dealer has 6 or less, stand if dealer has 7 or more; 19 – stand. This will vary person to person, and depending on the game you are playing, but this is a good place to start. Blackjack Single Deck from Cryptologic proves once and for all that the digital age has caught up with the real world, and that you can approach the experience of being in a casino from your own home. The realism captured in this game is authentic, and will not disappoint. 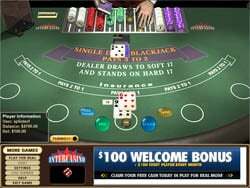 This is a single deck game of blackjack that you will enjoy playing (and winning!) day after day.